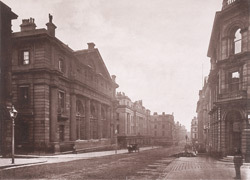 "A branch of the Bank of England was first established in Manchester September, 1826, in the premises in King-street now forming part of the Bank of Messrs. Cunliffes, Brooks, & Co. In course of time this was found inadequate to the requirements of the community, when it was determined to erect a new building - the one shown in our illustration. It is a substantial stone structure, of the Doric order of architecture, after the designs of Mr. Charles Cockerill: the first stone was laid July 31, 1845, by Mr John Reid, the then agent, and the doors were opened to the public in March, 1847."